this summer since I have been over here, the bridge have been taken off from most all of the streams & in fact, there would have been none left if they had not been fastened down, the bridge at Walters mill & the one at Father & the big bridge here were saved, the water was over the top of this big bridge, the water came up 4 foot higher than it was the fall that you went away. Queen City came pretty near being under water. The Marshall farm was all under water, as the mails have not been comeing regular, as they could not cross the streams, the mail went by Rutssels & them down to the bridge by Grathes to cross the creek. -1 was sorry to hear of [Gurny's] death, has Alexander with you? I suppose he is as there is not prospect of any more fighting at pressant. 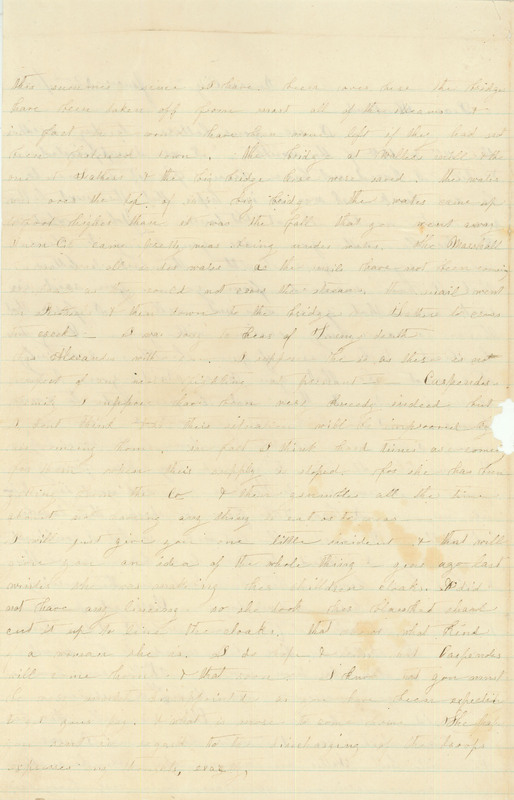 - Carpender's family, I suppose, have been very kneedy indeed, but I don't think that this situation will be improved by his comeing home, in fact, I think hard times are comeing for them when their supply is stopped, for she has been getting from the Co. & then grumbles all the time about not haveing any thing to eat or to wear. - I will just give you one little incident & that will give you an idea of the whole thing, year ago last winter, she was makeing her chilldren cloaks & did not have any lineing so she took her blanket shawl, cut it up to line the cloaks, that shows what kind of woman she is. I do hope & trust that Carpender will come home & that soon. I know that you must be very dissappointed as you have been expecting to get your pay & what is more, to come home. The paper you sent in regard to the disscharging of the troops expresses my thoughts, exactly.